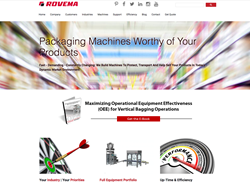 Rovema North America – a subsidiary of Rovema GmbH, which designs and supplies packaging machinery for the food industry – has launched a new content-rich website, http://www.rovema-na.com, designed to assist a wide variety of industries in developing and maintaining highly efficient vertical form-fill-seal (VFFS) bagging operations. The easy-to-navigate site is a wellspring of information and resources on vertical bagging, industry news, and Rovema’s wide range of machine solutions for filling and end-of-line packaging. “The new website exemplifies our commitment to transparency and the empowering of North America’s CPG manufacturers,” said John Panaseny, CEO of Rovema. Rovema’s new site was developed in response to customers asking for more helpful content, technology updates, and channels of engagement to assist them in making optimal VFFS decisions. The comprehensive site features a blog with posts about vertical bagging insights and industry news, as well as an extensive resource center with relevant material such as tech notes, training tips and general VFFS information. By serving as a resource for a wide variety of industries producing a broad array of products, Rovema is positioning itself as a resource that manufacturers can tap for insight on making vertical bagging the most efficient, highest-return aspect of their production operation. In addition to providing comprehensive details on the company’s line of premium Vertical Form-Fill-Seal (VFFS) baggers, Rovema.com also features thought leadership items, such as a downloadable Vertical Bagging Operational Equipment Effectiveness (OEE) guide for Consumer Packaged Goods (CPG) manufacturers. Rovema created the 19-page guide to help small- and medium-sized businesses adopt the same best practices that multinational corporations rely on to optimize production efficiency. The website presents examples of ways Rovema can assist food manufacturers with sector-specific challenges, including a discussion of potential sealing issues when packaging nuts; a look at options for minimizing product in the seal jaws in snack food packaging operations; and an exploration of ways to improve coffee shelf life via the use of nitrogen gas flushing as part of a VFFS system. In doing so, the site addresses issues from a functional perspective, presenting information that might be sought by an engineer, maintenance manager or purchasing director. The site is also highly interactive. Here, features include monthly email reminders, and a simplified ‘request a quote’ process in which users can obtain estimates and/or detailed machine proposals. Links to social media platforms – including Facebook, Twitter, YouTube, Instagram, Pinterest, and LinkedIn – further encourage visitor participation. Service and support are emphasized as being at the heart of Rovema’s dedication to customers. Whether the need is for replacement parts, retrofits, upgrades and rebuilds – or technical service in the form of field service or telephone support – the new site aims to make outreach easy and accessible. Rovema GmbH is a global packaging machinery supplier that offers best-in-class products employing German-engineered excellence, forward-thinking innovation and optimal customer service. Markets served include bakery, confectionary, cereal, liquids, snack foods, frozen foods, dry powder and coffee, among others. The company manufactures and supplies equipment for dosing, vertical form-fill-seal (FFS) pouching, cartoning, and final packaging, as well as fully integrated turnkey systems. For more information, visit http://www.rovema-na.com.